Well it really is beautiful weather and far too nice to be indoors but my excuse is that having mowed the lawns this morning I need a little rest! I hope you are all having such lovely warm sunshine for the Easter weekend. I've been sewing again during the week and this time it was to make a very useful carry-around holdall for my hand sewing bits and pieces. I'd spotted something very similar being used some time ago and thought I'd like to make one so I did the usual search online and was lucky enough to find the pattern available to purchase from Craftsy.com. 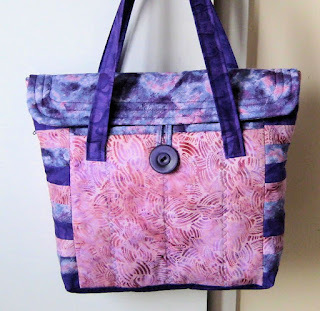 The design is called The Sew Together Bag by Sew Demented and the pattern is very well presented and despite being a bit fiddly to make it has worked out well I think. I used a selection of fat quarters from my Batik collection and for the three pocket zips and the longer top zip I've used continuous zip on a roll which is really handy for this kind of thing because you can just work with the tape part of the zip, leaving the slider well out of the way when stitching - as long as you remember to slide it into place before trimming off the ends of course!!!! As well as having the three zipped compartments there is ample space either side and between them to store all sorts of items. The bag is approximately 10 inches from end to end and of course the long top zip allows it to open fully to sit on the table. I've used up some snippets of fabric today to take along to the latest Playground challenge - the three fabrics were all left over from separate projects and some of them were in odd bits and pieces but luckily they toned together nicely to make this bag. I bought the pattern last week at the quilt show and decided to try making the plainer version to give the pattern a try out before going for the more complicated version which has applique houses on the front pocket and a pieced panel for the zipped pocket on the back. Both versions are quite heavily quilted although I've actually not done quite as much as was suggested in the instructions. I found the instructions to be quite clear to understand but the construction method seemed a bit more complicated than I was expecting but I got there in the end although it did take me much longer to make than usual. All the while that I was stitching my mind was working out how it could be made using a much simpler method of assembly and I will probably play around a bit and then try adding the applique. The pink panel on the front is a quilted and bound pocket and on the back there is another picket which incorporates a zip, the flap is fastened with a 'lucky find' button of the right colour after a little root through my box of odd buttons. I visited a quilt exhibition and show at the weekend with two friends and we saw lots of lovely work. 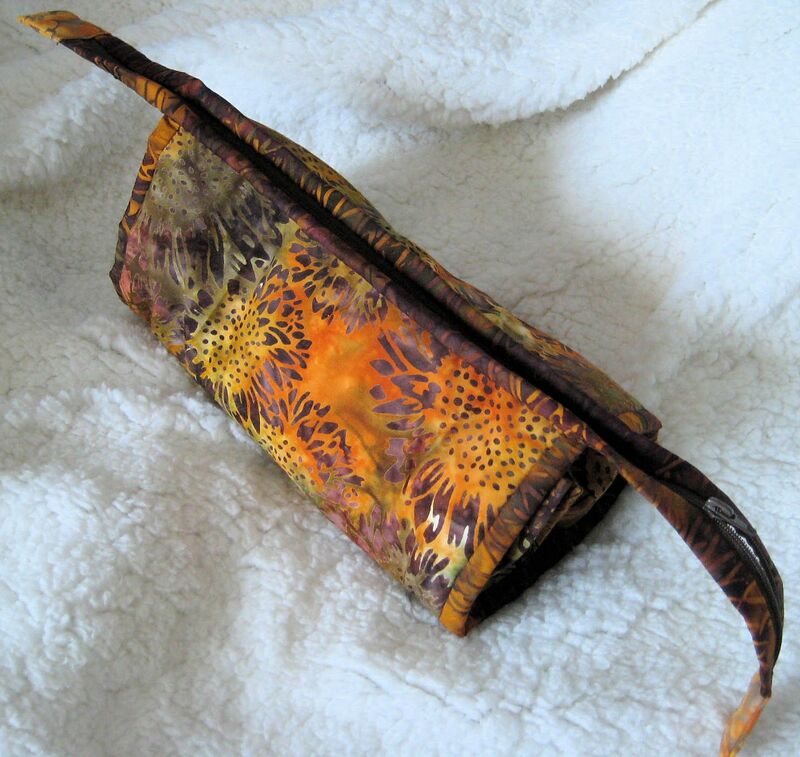 As always I was drawn to the stands which were displaying bags and other smaller items to make and spotted a bag very similar in design to one I'd made previously but this one had been made using squares of fabric. 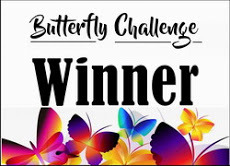 I took careful note of the number of squares used so that I could hopefully replicate the design using some of my collection of lovely Batik fabrics. It took some time to measure and cut the 48 different squares and to find suitable fabric to complete the outer bag, the handles and ties with of course something suitable for the lining. Luckily I have quite a stash of fabrics so didn't need to buy anything for this project. 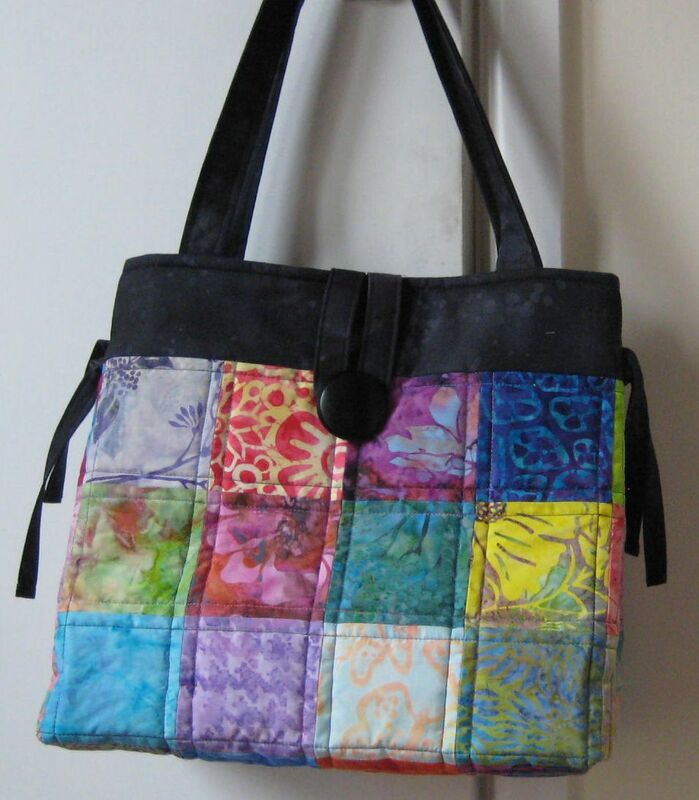 It has turned out to be quite a roomy bag which has ties at the side so that it can be quite compact (approx 12" square and 6" deep) like a handbag but if the ties are undone it opens out into more of a shopper. 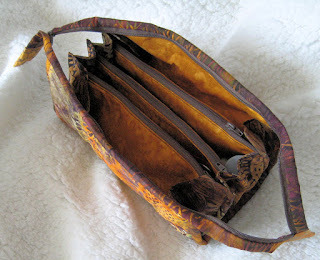 There are pockets inside in the lining. It fastens with a fabric loop and a large button. 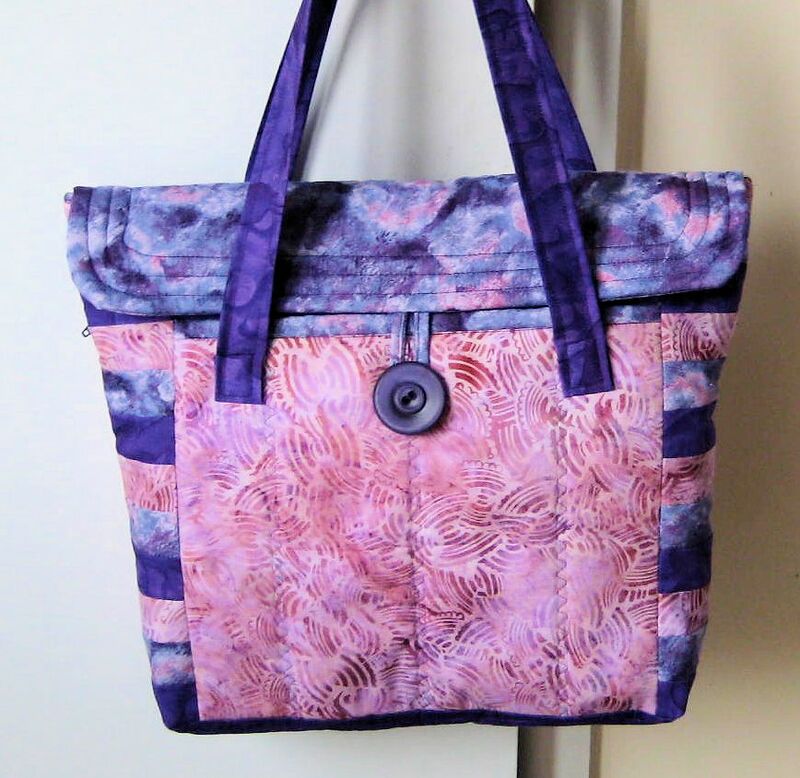 The style of the bag is based on a design by Juberry Fabrics who produce quite a range of patterns, kits and of course sell lovely fabrics. I wanted to make a card for my grandson which was a bit quirky and not the usual 'run of the mill' things produced for males so I had a little trawl amongst some of the miscellaneous files saved on my computer - many from some years ago and it was a good exercise in reminding me just what I do have stored away and pretty much forgotten!! 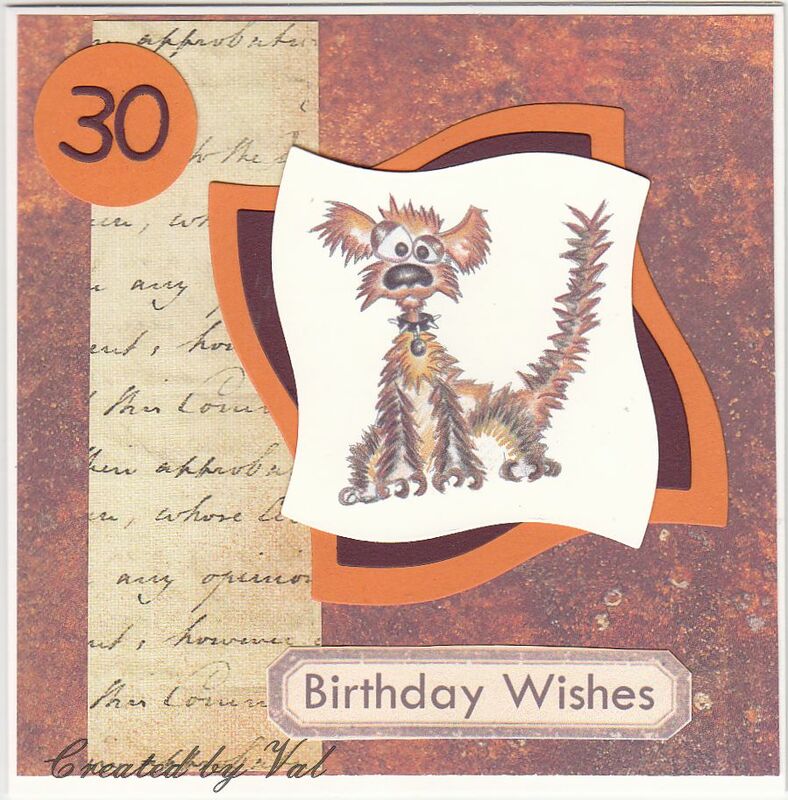 I eventually settled on this dog image which I printed and then cut out using some wonky squares dies which haven't been used for ages but I thought they were just right for this card. I finally added a random strip of text paper, a greeting and the number along with a patterned background paper trimmed to suit and which was the last remaining piece from a pad. He has a gorgeous Golden Retriever which is much more beautiful that this zany pup but I hope he will like my choice of image! 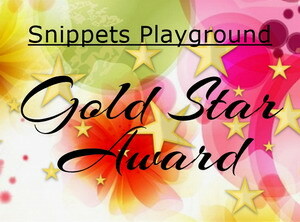 Everything apart from the base card can easily be classed as a snippet so this card will be taken along to the Playground for their latest challenge before I pop it into the post. I have another parchment card to share today with a pricked and snipped border made using part of one of the 'Queen' duo border plates. I do enjoy doing this kind of thing but it is quite time consuming - keeps me out of mischief though!! 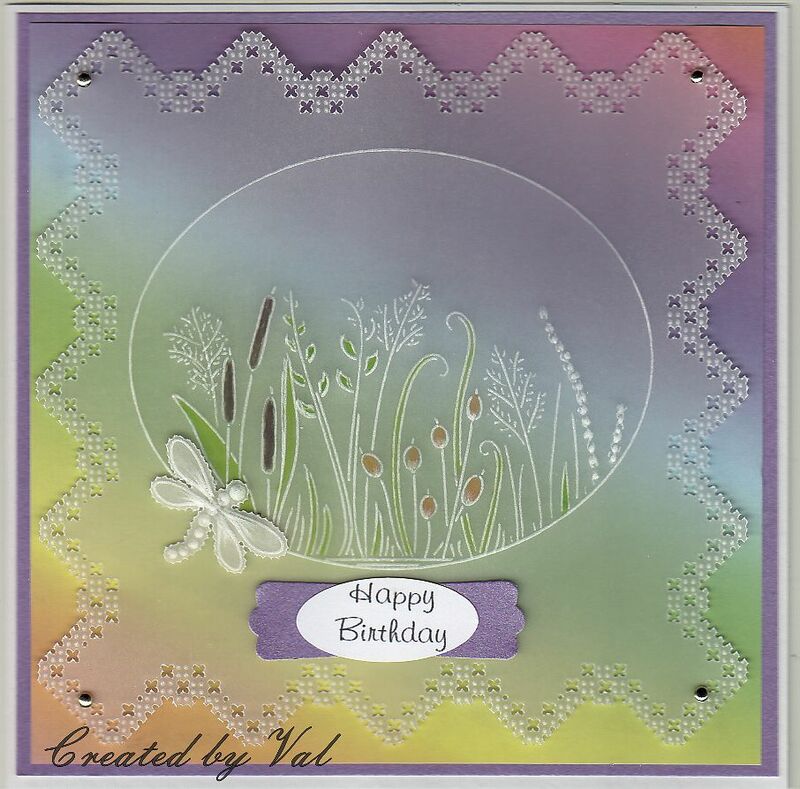 I simply added an oval with some grasses and a printed and punched greeting. Time for another Christmas Kickstart challenge and this time the theme is 'Moves on Hooves' and I've chosen to include some reindeer moving across the sky towing Santa. 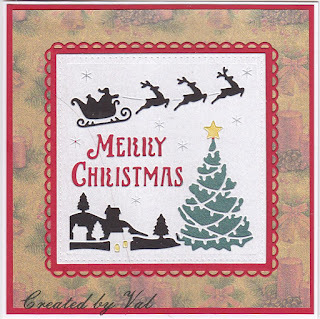 The main image was made using a die which came free with a magazine a couple of years ago and once cut I backed it with small scraps of coloured card behind the cut-outs. The outer scalloped square was also part of this very handy die set. 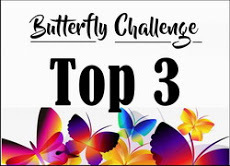 It is well worth popping over to their blog to see several ideas for using a variety of animals which have hooves - some great inspiration. The theme for this challenge is 'Balloons' as well as the usual idea of making two cards in different colours or style and for different occasions using the same stamps, dies etc. As I have a set of balloon stamps which I know haven't been used for quite a while I thought I'd have a go this time. 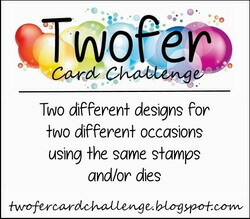 There is plenty of inspiration by the design team if you pop over to the Twofer Challenge Blog. 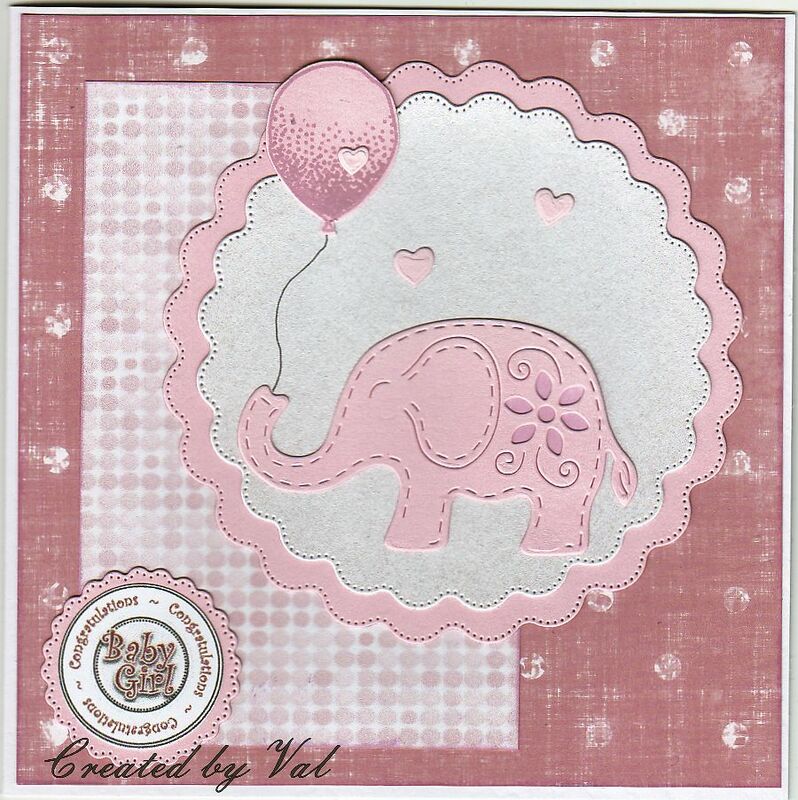 For my first card I've stamped just one of the balloons and combined it with a die cut elephant to make a baby card. 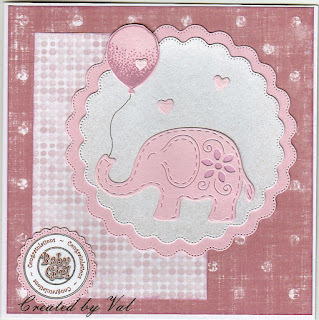 I layered up some pink papers before die cutting two scalloped circles on which to pop the elephant and balloon. 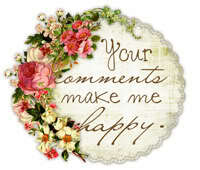 A sentiment was added onto a smaller matching scalloped circle. For the second I stamped three balloons onto a scrap of watercolour paper which had been coloured with Pixie powders and was left from another project. 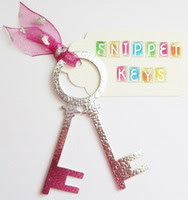 In both cases the balloons were cut out with scissors although there is a punch available which matches the stamp set. I sorted out some paper and card which matched the colours and die cut some banners. 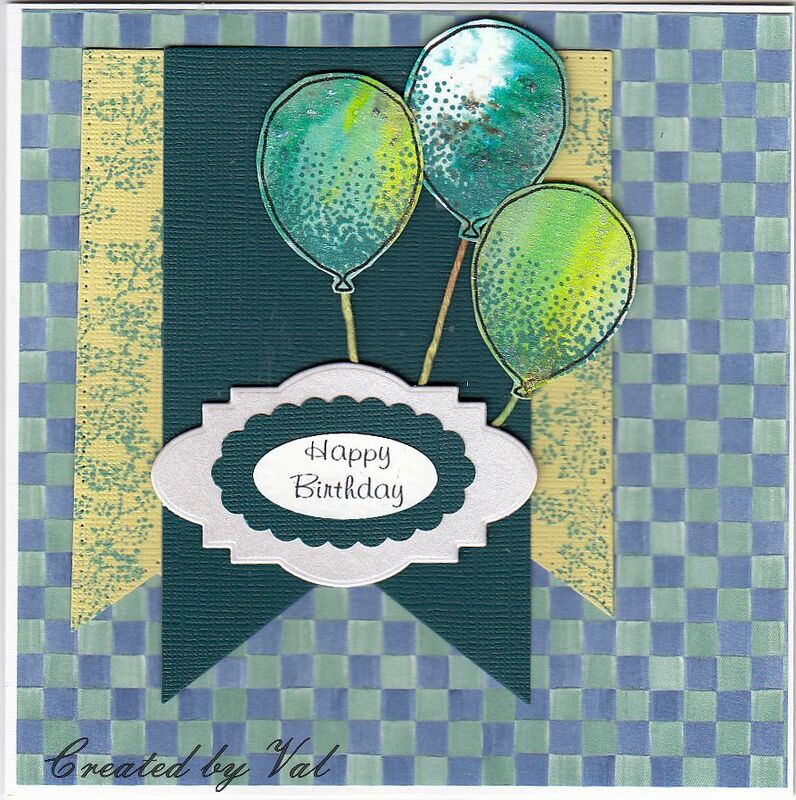 Coloured string was added to the balloons and the computer sentiment was punched out before popping onto a scalloped oval and an odd die cut shape which was lying around just waiting to be used. There was some over-stamping on the narrow sections of the banner. Edited to add side by side picture - thanks to those who pointed out the 'rules' - should have read them more carefully! !